As we all know, there is a big push in California to ban plastic straws. The anti-straw campaign has been active for quite some years now. 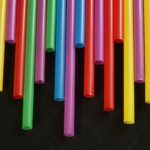 Recently, they received a huge breakthrough in California when the state passed legislation requiring restaurants to only hand out straws when customers ask for them. However, for those standing with the movement to remove straws altogether, this law is a giant turndown. Fast-food restaurants like McDonald’s, coffee shops like Starbucks, and restaurants with take-out are exempt from the ban. Any Californian knows that constitutes most food businesses in the state. Though comprised of many organizations and nonprofits speaking out and banding together for the cause, the anti-straw movement received national attention in 2015 when a video went viral of a straw being pulled out from a turtle’s nose. The video, 8 minutes long and painful to watch, created widespread disdain for the disposable nature of these drinking utensils. In the succeeding weeks of the video, the conversation extended the harm to all plastics in the ocean. California voted to ban plastic bags in 2016, and cities such as San Francisco and Los Angeles began creating more stringent laws to remove even more plastic items. Santa Barbara even went to so far as to approve jail time for straw ban violators. While there is great contention over the actual daily U.S. consumption of straws, as well as the true impact it places in our seas, food businesses have sworn to eliminate plastic straws in their establishments. For instance, Starbucks has publicly committed to eliminating straws by 2020, already starting by transitioning customers to the use of their new sippy lids. For their blended beverages, they will provide compostable paper straws that are biodegradable, and certainly unable to maintain their shape when they make their way to beach or waters. Opponents of the ban strongly feel that this push to get rid of straws is nonsensical. As it’s been disputed how much a contributor to ocean waste straws actually are, there is a counter protest that straw ban laws will not reduce the environmental impact and simply inconvenience consumers. Furthermore, as many citizens rely on convenience in this day and age, which allows society more time to focus efforts on other matters, taking away straws could be viewed as a halt on societal progression. Regardless of the true percentage of trash made up of straws in the California Coastal Cleanup, the solution may be to make all waste biodegradable to prevent more plastic from going into the ocean than is already in there. As always, the debate lies in whether the the free market will naturally achieve this means, or if the urgency necessitates government intervention. As of 2019, restaurants in Calabasas has set regulations in place for this progressive trend. Breaking and dining businesses such as Blue Table, Marmalade Cafe, Twisted Oaks Tavern and Blu Jam Cafe have been legally obligated to provide only paper straws to their customers. Other restaurants are looking at bamboo straw alternatives for customers who complain about paper. For residents of California, we can expect to see certain areas taking initiatives to prohibit the spread of more plastic materials, straws included. Cities such as Malibu, Calabasas, and Agoura Hills will likely continue taking strides to curb the rate that plastic is being dumped into the ocean.